Bologna Baroque is an ensemble ranging from a trio to a baroque orchestra, which pays particular attention to composers from Bologna. This explains why it recorded cello sonatas by Antonio Vandini, since he was born in Bologna and was the product of the Bolognese cello school. Among its main exponents were Domenico Gabrielli and Giuseppe Maria Jacchini; the latter was most likely Vandini’s teacher. However, for most of his life he worked elsewhere. From September 1720 to April 1721 he was maestro di violoncello at the Ospedale della Pietà in Venice, where he was a colleague of Antonio Vivaldi. The latter may have written some of his cello concertos for him. In November 1721 Vandini entered the cathedral orchestra in Padua. It is a token of his reputation that he was appointed without being examined. In April of that year Giuseppe Tartini had been appointed primo violino e capo di concert. The two men became close friends and worked together for the rest of their lives. Together they travelled to Prague in 1722, where they participated in the musical celebrations of the coronation of the Habsburg emperor Charles VI as King of Bohemia in 1723. They remained here until 1726. After their return to Padua they often performed together, and Tartini composed two concertos for Vandini. The latter retired from service at Padua Cathedral in 1770, and returned to Bologna, where he died in 1778. Vandini’s compositional output is very limited: only a cello concerto and six sonatas for cello and basso continuo have come down to us. Whether he wrote more is not known. It is a shame that so little from his pen has been preserved, because the six sonatas played here are outstanding pieces. Five of the six comprise three movements, in the order slow (grave, adagio) or moderate (andante), fast, fast. This is the pattern which became fashionable in the mid-18th century. The first movements are always the longest, sometimes even very long, such as the grave from the first Sonata in B flat (track 7), which takes seven minutes, compared to 3:50 and 1:16 for the remaining movements. These sonatas also bear witness to Vandini’s virtuosity, as several movements explore the highest positions. That is the case, for instance, in the allegro from the Sonata in a minor. The first allegro from the Sonata in B flat, just mentioned, is also virtuosic. One of the most brilliant pieces is the Sonata in C which ends the disc. It comes in two movements: in the first, which has no tempo indication, Vandini explores the highest register of the cello, and the piece closes with a highly virtuosic allegro. There is an interesting aspect to Vandini’s playing. Charles Burney wrote: “It is remarkable that Antonio [Vandini] and all the other violoncello players here, hold the bow in the old fashioned way, with the hand under it.” There is also a portrait of Vandini, showing his holding the bow in the manner of a viol player. Some documents from Padua call him a player of the viola or violoto. One wonders whether this refers to a specific instrument, different from what is now known as the baroque cello? Was this the reason that Antonio Mostacci chose a violoncello piccolo with five strings for his recording? Unfortunately the very concise liner-notes omit any information about the choice of instrument. Burney also mentions that Italians admired Vandini’s performing, saying that he played “a parlare, that is, in such a manner as to make his instrument speak”. 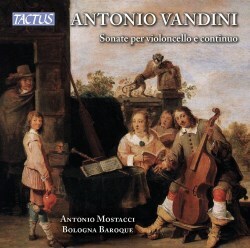 That is also the way Vandini’s music is played here by Antonio Mostacci. The lyricism of the opening movements comes off superbly, and the fast movements receive technically brilliant and musically sparkling performances. The tempi are well chosen; only the andante which opens the first Sonata in C (track 1) might have been played a bit faster. Mostacci receives apt support from his colleagues. These sonatas “deserve a prominent place in eighteenth century cello literature” Antonello Manzo states in his liner-notes; he is absolutely right: these sonatas are major additions to the repertoire and these artists are very eloquent advocates of Vandini’s music.